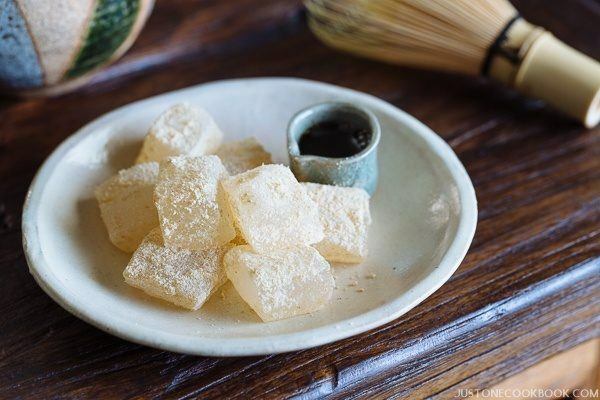 Warabi Mochi is a chilled, deliciously chewy, jelly-like mochi covered with sweet and nutty soybean powder and drizzled with kuromitsu syrup. I usually spend my summers in Japan with my children, and that’s when they explore new Japanese foods that are not always available in SF Bay Area. Warabi Mochi (わらび餅) was their new “discovery” this year and I’ve enjoyed making it at home after we came back. If you haven’t heard of Warabi Mochi (わらび餅), don’t worry, you’re not alone. There are many types of “mochi” in Japan, and this is just one of them. And unfortunately, this type of mochi is not so well-known outside of Japan. Maybe it’s due to the lack of available ingredients to make them. Warabi Mochi is made of warabi starch or bracken starch. Warabi/bracken is a type of ferns, and the starch comes from the rhizomes (underground stem). 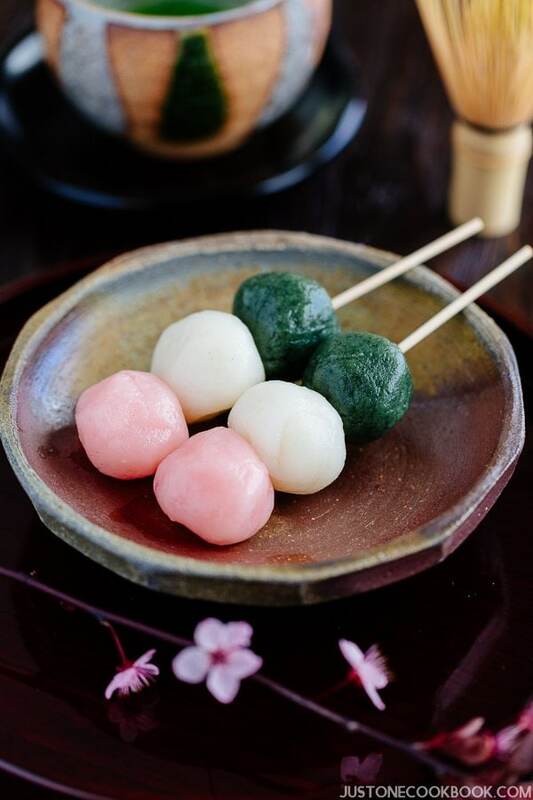 Unlike typical mochi made from glutinous rice, warabi mochi’s texture is more jelly-like and it’s chewy yet dissolves quickly. 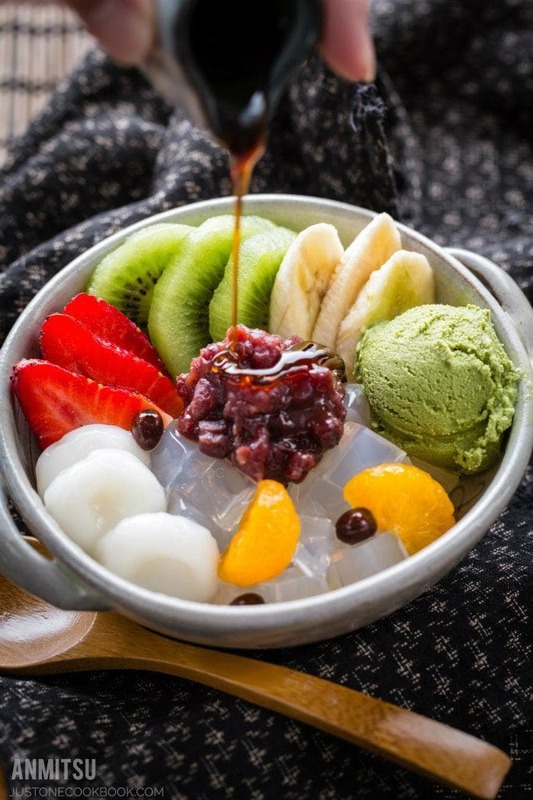 Because it is clear and looks refreshing, warabi mochi is often enjoyed in the summer time. What does it taste like? Believe it or not, it has almost no flavors – the only thing you taste is the sweet toasted soybean flour or kinako and the kuromitsu (黒蜜, brown sugar syrup). Sometimes red bean paste is wrapped inside the warabi mochi too. Making this Japanese sweets is the easy part. The hard part is getting the main ingredient – warabi/bracken starch. Most likely typical Asian grocery stores won’t carry it so you’ll need to check Japanese grocery stores. There are 2 types of warabi/bracken starch. This is the pure starch from warabi (but please read next section for more details). It’s very expensive because it’s difficult to harvest, and only a small amount of the roots (just 5%) becomes starch. It is also very time consuming to process it into powder. If it’s made from hon warabiko then price is usually very expensive. Warabi mochi made with 100% warabi/braken starch is more brownish or blackish color. The package comes in clay-colored pebbles (not powders). If you refrigerate warabi mochi, it gets hard. Therefore, true warabi mochi is stored at room temperature all times and it only lasts for a day. Majority of warabi mochi that you can purchase is made with other starch, not warabi starch. If you look at the ingredients, it should say sweet potato starch (甘藷(サツマイモ)澱粉) or tapioca starch (タピオカ澱粉). Warabi mochiko is more reasonably priced, and you will probably find this type in a Japanese grocery store. Warabi starch I used for this recipe is “warabi mochiko”, the sweet potato starch type. While I was researching where you can buy braken starch, I found out that you can get “hon warabiko (本わらび粉, 100% warabiko)” on Amazon here and here. However, I’ve also read that because there is no regulation, a lot of places sell the mixture of warabiko and other starch as “hon warabiko”. So keep in mind that it might not be 100% braken starch even though the box says so, especially if it’s relatively affordable price (but it’s more expensive than warabi mochiko). 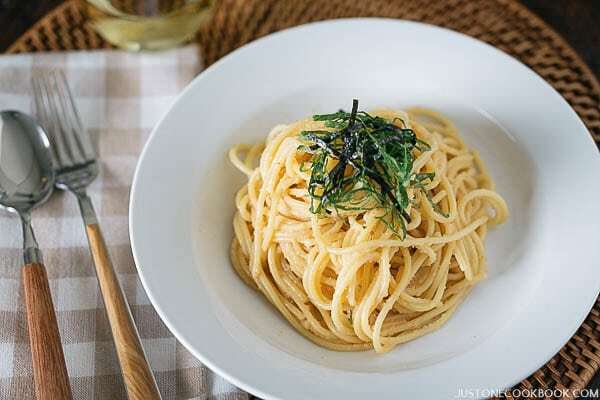 If you’re looking for kinako, toasted soybean flour, you can find a really good quality one from Hokkaido this company that ships internationally, or here on Amazon. For kuromitsu syrup, you can purchase it here on Amazon. Or, you can make with an equal part of brown sugar and water to make the syrup. I hope you enjoy making this warabi mochi recipe! If you make this recipe, snap a picture and hashtag it #JustOneCookbook. I love to see your creations on Instagram, Facebook, & Twitter! Thank you so much for reading and till next time! Prepare all ingredients and sprinkle some kinako on a baking sheet. In a medium saucepan, combine the Warabi Mochiko, sugar, and water. Mix all together. Heat the mixture over medium heat until it starts to boil. Then reduce the heat. Using a wooden spatula, stir (more like beat) constantly and vigorously for 10 minutes, or until the mixture is thick and evenly translucent. It’s quite a workout but be patient, it’ll transform to clear color! Remove the mochi from the heat and transfer to a baking sheet that’s covered with kinako (soybean flour). Sprinkle more kinako on top and let it cool in the refrigerator for 20 minutes. Once it’s cooled, take it out from the refrigerator and slice into ¾ inch cubes. 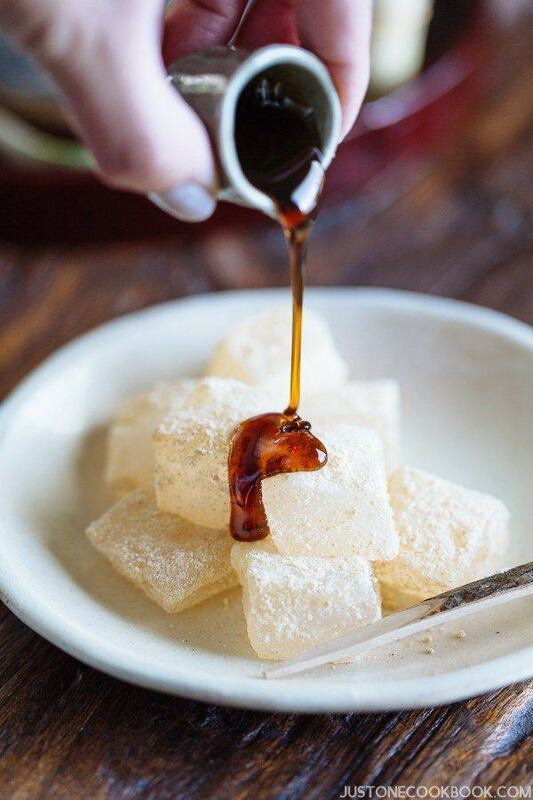 Toss the warabi mochi with kinako and serve on the plate. 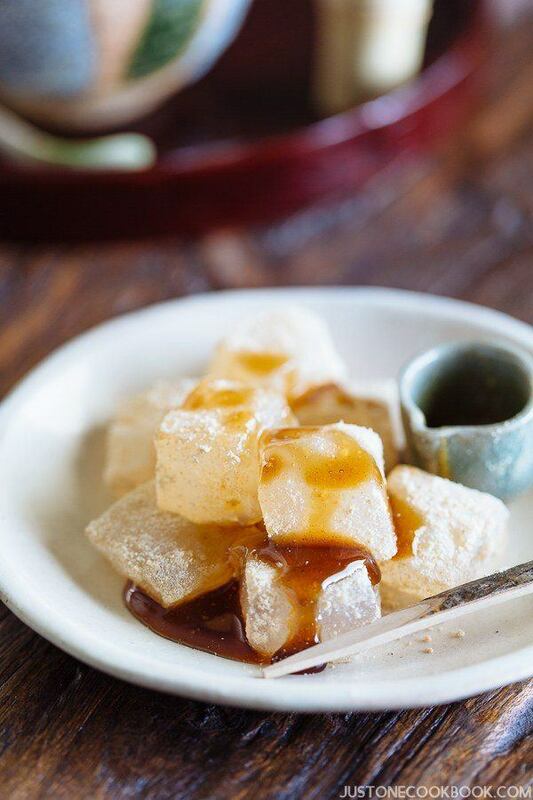 If you like, pour the Kuromitsu (brown sugar syrup) over the Warabi mochi and enjoy. 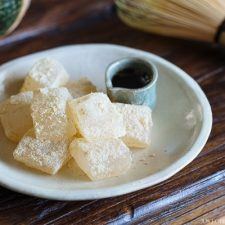 You can save warabi mochi at room temperature for 1-2 days. If you keep in the refrigerator warabi mochi gets hard and becomes white color. Warabi mochi is tastier if you refrigerate for 20-30 mins before you eat. If you use real warabi starch, it lasts only for a day and must be enjoyed soon. If warabi starch is mixed with other starch, it lasts longer, but the color is not as clear. Warabi Mochiko or Warabiko: To substitute, you can use potato or tapioca starch. However, please note that it will be a different consistency. Granulated Sugar: The ratio of warabi mochiko and sugar ratio is usually equal. However, if you use kuromitsu syrup, I recommend reducing the amount of sugar (use 1/3 cup or 80 g sugar). OMG, Nami I just watched on Shinichi and Satoshi’s channel they went to Saitama Prefecture to see the Spider Lilies And towards the end the Had the Warabi Mochi with Kinako on it! I love kinako its so yummy and the Mochi looked different but still looked awesome and yummy! I hope you all are having a wonderful family trip. I love seeing your adventures in AZ! Take care of yourselves and have a safe trip back home when you head that way. I don’t have a sweet tooth which is why I like most Japanese sweets, but kuromitsu… It’s just not possible!!! Oh and u have a question, since cold days are back, do you have good autumn/winter recipes using kabocha as main or side ingredients? I already checked the soup and tempura but I wondered if there eye some other dishes you could suggest. I can look through Internet for the recipe! As for kabocha recipe, I usually make kabocha soup (recipe on blog), kabocha korokke (I should share the recipe…. ), simmered kabocha (recipe on blog), stir fry (recipe on blog) and gratin….. etc. This recipe just come in the right time as it’s getting warmer every day here in NZ. Not to mention it will be a perfect match with the tea I brought back from Japan. I am going to use the tapioca flour in my cupboard as a substitute. I just hope it will turn out as good as yours! I’ve heard from someone that tapioca flour will work as substitute. I don’t own tapioca flour so I’ve never used it, but do let me know! I’m sure others who have tapioca flour is curious to know too! New dish to me! And it sounds like a good one. I always learn something from your posts — so much fun to read. Thanks! Thank you John!! I’m humbled and happy that I could bring a little bit of Japanese food and culture to your life. 🙂 Thank you for brightening my day with your visit! Namiko-san: I had this once at a restaurant in New York City for dessert. It was a restaurant that only served pork trotters (foot or feet). It was not exciting to eat as not much meat on it. But, the dessert was heavenly. I am glad that u reproduced it here for me to use. Also… Namiko-san: I am going to New York for the Thanksgiving Holidays. Do you or your readers have a great recommendation for restaurants there in Manhattan. Hi Carol! Wow, that’s an interesting restaurant! Was it Okinawan restaurant? This looks so delicious, Nami! 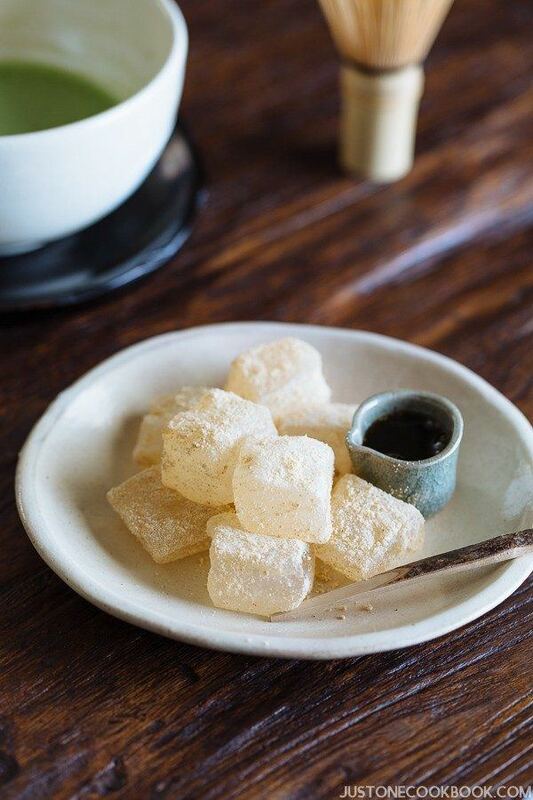 I’ve never tried warabi mochi but we love mochi and this sounds amazing! I fell in love with the texture of warabi mochi when I visited Japan in March! The texture is so unlike any other mochi I’ve ever had. I always want to make it at home but I have not been able to find anywhere (reputable) online or in store that sold bracken starch. I had also tried warabi made from substitute starches while in Japan but the texture just pales in comparison to hon warabi! As you say, hon warabi has little to no taste but to me the real appeal is its texture! I remember eating this and somehow it reminds me of the kinako age pan that I loved so much. Maybe because of the kinako. Definitely will give a try if I can get the ingredients though I am wary of buying hard to find ingredients as I like to procrastinate on trying recipes. I cannot believe you have posted the recipe of my FAVOURITE Japanese sweet snack! (I mean the only one I like in Japan… don’t be angry…, but I love it so much, I have it as much as I can while in Tokyo; there is a shop selling it and also serving it in their tea room…). I bought the special flour last year and left it in the hotel room 🙁 Obviously here it’s not available…. My number one is with matcha of course! Thank you so much for bringing back fantastic memories. I’ll make it if I ever find the right flour here. (If I’m desperate I’ll try replacements…. thank you for the tips!). Thank you Nami for the long-awaited warabi mochi recipe. During our first trip to Japan this past May, we did try warabi mochis at the flea market of Toji Temple in Kyoto. We had the clear ones (sold by weight) as well as the large mochi-sized ones with the red bean fillings . Very interesting texture, though they weren’t served with kuromitsu syrup. Perhaps because of the flea market setting. Sure glad to have tried them in Kyoto as I believe warabi mochi is more of a Kansai dessert. I was wondering if you could suggest a brand of warabi mochi making kit that passes your taste test. I read online that they contain all the ingredients you need: warabi mochiko, kinako, & syrup. Or do you think it’s better to make from scratch like following your recipe? Your advice will help me to decide what to ask someone to bring back from Japan. By the way, in Kobe, we bought some mochis from a stand just outside the Tarumi Station (垂水駅). Since it was May, we were lucky to taste sakura mochi. 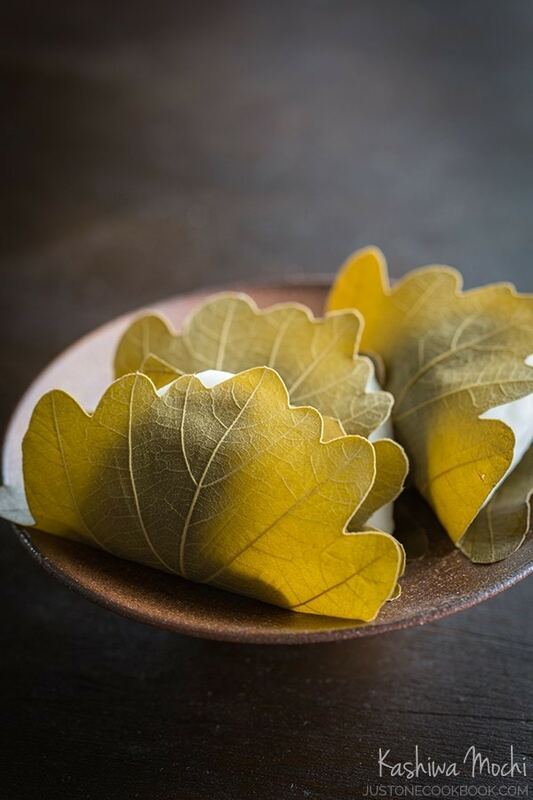 To be honest, I wasn’t thrilled with the pickled sakura leaves, maybe because it’s an acquired taste or maybe I need to try it from a real wagashi shop. In a box of mixed mochis, there were some kuzumochis 葛餅 made from arrowroot starch; transparent, jelly-like exterior filled with red bean paste. If I remembered correctly, the texture of kuzumochi seemed to be thicker than that of warabi mochi. Is kuzumochi also a summer treat like warabi mochi? Sorry for the lengthy comment & questions. Thanks in advance. Hi Christina! Thank you for waiting for this recipe! 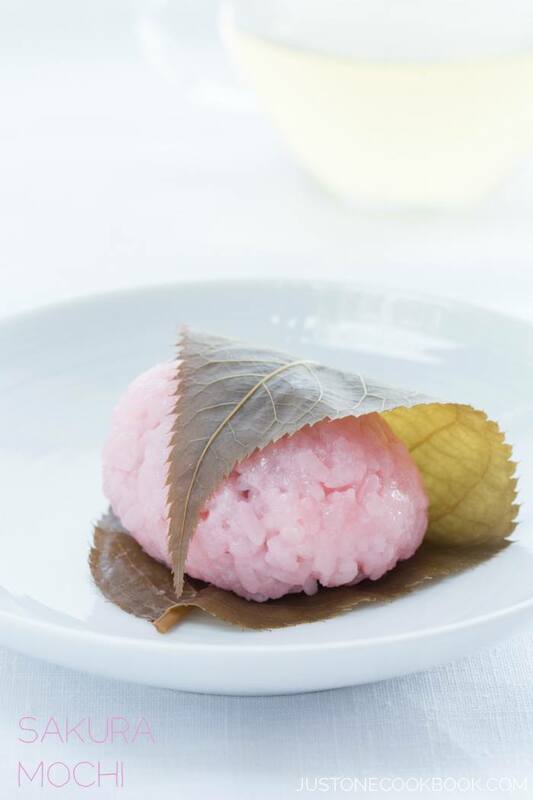 Yes, Kuzumochi is often enjoyed during the summer time because of its “cool” look. I should make kuzumochi recipe next time! Oh sorry if I didn’t explain properly in my previous comment. I don’t want to buy the really expensive warabiko, but to purchase the warabi mochiko (the type with the sweet potato starch as used in your recipe). A professor returns home (to Japan) after each semester and I’m thinking of ask him to bring back a bag or two warabi mochiko so I can try your recipe. I’d imagine it’s easier to find warabi mochiko in Tokyo or is it only sold in Kyoto? Also is it possible to purchase warabi mochiko in Jpanese grocery stores like Mitsuwa Market Place, Tokyo Central if I ever visit California? Hi Christina! Oh, sorry for misunderstanding! Warabi Mochiko is very easy to find in Japanese grocery stores both in Japan or California. In the supermarket here in California, you probably have 1-2 brands though. And they are not 100% kind (but since you’re okay with it, you will have no problem). 🙂 Hope you enjoy making this! Looking forward to making warabi mochi when I get the ingredients. ???? Wow this certainly is a different type of mochi for me, never seen anything like this. Need to make one soon! These look awesome Nami! I love all of these little sweet things you introduce and this one really has my interest. Love everything about it. Thanks! This is amazing ! I have always loved warabi mochi but the problem was that I could only eat it when I go to Okinawa! Now I can make my own! I can’t wait to test this out ! Big thanks to Nami-san !!!! I am so glad I found you on YouTube ! Thanks for sharing your mochi recipe and for the explanation on the different types of flour to make it. I tried your recipe twice and the first time, it came out very well! The mochi has the right texture, a bit chewy and sticky, just like those I had in Japan! However, the second time i tried making it, the mochi turned out not chewy at all. It just gave way once i bit into it, without and bounce or stickiness to it. I was trying to figure out what’s wrong as I was hoping to make a batch for my family who love the japanese mochi a lot. The only thing I could think of is that i cooked it longer than the first time as i was trying to make it more translucent the second time round. Would you be able to give me any advice on this pls? Hi Joyce! Thanks for trying this recipe! I’ve read somewhere that if you refrigerate it, it will lose the mochi texture. Do you remember if you cool warabi mochi when you made 2nd time? Love your recipes! So easy and makes me feel like I’m back in Japan. 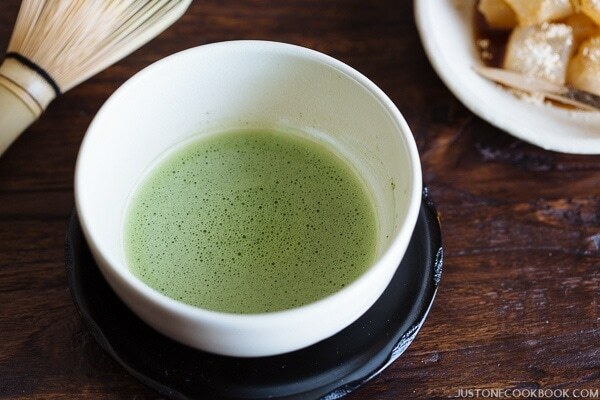 Have you ever made Matcha Warabi mochi? I’d love to know how to make that! One of my favorites. Hi Jessica! Hmm I actually never tried it before even though I’ve seen it sold next to traditional one. I’ll have to give it a try! I can’t find warabi mochiko where I live – would a regular bag of tapioca starch or sweet potato starch do the trick or is there some other magic ingredient? Thanks! i’m making it now and followed the recipe but it looks really watery what should i do? Hi Judi! Sorry for my late response. How did it go? Did the water / excess moisture go away as it cooks down and evaporate? Thank you for all the wonderful recipes of my favorite Japanese foods. It would be really helpful to have a picture of the packaging of the ingredients you can find in the US. Even though it may not be available everywhere, it is useful to see how things are typically packaged and sold. Hi Jennifer! Thank you for reading my blog. Have you seen my Pantry page? I show pictures of packaged products there. Thank you so much for the links! I will also try it with potato starch. What color should it be when using potato starch? Should it also be translucent?